In a constantly evolving world, safe and well-organized medical care is vital. From emergency rooms to private practices, innovative medical devices help streamline patient interaction, care and rehabilitation. 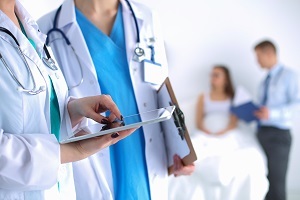 Optimize your healthcare application with sanitary rubber solutions from Minor Rubber. We are a top molded, extruded, and fabricated rubber part manufacturer for the healthcare industry and its suppliers. Whether you need production of existing components, prototypes for research and development or replacement items for hard-to-find or obsolete applications, we have the capabilities and expertise to supply quality rubber parts on time and within budget. Medical devices are invasive by nature, from probing in and around the human body to combating disease and repairing damage. Implantable devices like hip replacements, artery stints, new valves and pacemakers are designed to remain inside the body long term. Rubber used in medical-grade applications must have strong biocompatibility, superior temperature and chemical resistance, good mechanical and electrical properties, and natural clarity or translucence. Also, these products must be produced in a safe, contamination-free environment. Minor Rubber manufactures a variety of Food & Drug Administration-certified clean room rubber parts for healthcare applications, from general-purpose components to long-term implantable parts. Combining a vast range of high-quality materials with decades of knowledge and expertise, we can help you serve patients better. While off-the-shelf rubber products are suitable for some markets, the healthcare industry requires precision parts to protect sensitive gages and instruments, transport bodily fluids and medicines, and seal openings from dust, contaminants and moisture. Obtain the best rubber part for your medical-grade application with Minor Rubber’s custom rubber fabrication services. Founded in 1914, our staff can guide you from concept through production. We utilize industry-leading manufacturing processes, rubber formulations and quality controls. Minor Rubber can handle complex designs and extensive customer requirements. In-house tooling capabilities enable us to manufacture accurate tooling quickly and economically for precision production of your custom part. With more than 100 years of rubber product development experience, Minor Rubber understands the healthcare industry is constantly evolving. We stay on top of our industry by being experts in yours. Parts are manufactured in accordance with ASTM, MIL-R or customer specifications, and quality personnel perform inspections throughout myriad manufacturing process stages. By combining innovative technologies with knowledgeable engineering, skilled craftsmen and superior customer service, Minor Rubber can deliver exceptional healthcare processing rubber solutions. Request a quote from Minor Rubber today to order your parts.